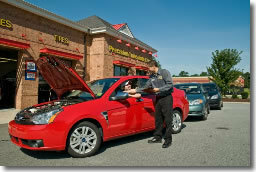 Precision Tune Auto Care is the right franchising concept for the times. Precision Tune Auto Care began as a small tune-up shop in Beaumont, TX and has grown to 350 service centers operating in 6 countries. We are a recognized world leader in the automotive service industry. 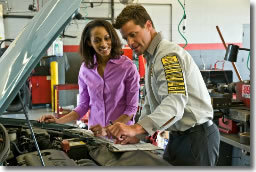 Our service centers perform diagnostics, scheduled maintenance and auto repairs. Our brand proposition can best be described as a successful combination of "customer care" and "car care" services. On top of all that, higher gas prices work to our advantage as people are servicing and repairing their vehicles instead of purchasing new ones. Why Choose Precision Tune Auto Care? Precision Tune Auto Care has been in the automotive aftermarket business for over 35 years. We know the industry and we make it easy for you to open an oil change/auto repair franchise by giving you the tools you need to begin your business. For entrepreneurs who want to be in business for themselves but not by themselves, we offer the total package. We call this...The Precision Advantage. Precision Tune Auto Care is a recognized leader in the automotive service market for a good reason—with over 35 years of experience, a proven franchise business model and initiatives that reinforce our Competence-Convenience-Caring auto care proposition—our brand is in position to take advantage of the growing consumer need for a "dealer alternative." Our focus on the Competence-Convenience-Caring market position allows us to deliver our services in a way that no other company duplicates. In addition, our concentration on providing a quality service experience has resulted in 85% customer satisfaction, and our marketing and advertising efforts have led us to enjoy an impressive 80% consumer awareness in our operational markets. Our international franchise partners, representing 80 centers, also enjoy the benefits of our leadership, business model and brand proposition no matter how it is translated. Marketing and adver�tising support is provided through a variety of tools designed to differentiate PTAC from the competition, promote brand awareness, solicit new business and retain customers. From the minute you become a member of our system, you'll start working with a team of experienced professionals. Our team provides experienced business and operational support to our franchisees in their local trade area. This support strengthens each individual center by helping owners avoid the pitfalls that independent garages often experience. There are many benefits to owning a Precision Tune Auto Care. We provide world class technical training, along with management and technical support throughout the entire business life cycle. The success of the PTAC brand is a collaborative effort between the franchisees and the franchisor, Precision Tune Auto Care. We're looking for franchise owners who are outgoing and who are results oriented. A person who can build relationships, lead a team, and who has the motivation to excel! You must have a minimum of $100k in liquid capital, and be ready to make a full-time commitment. 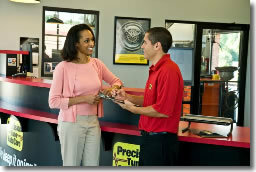 Click on Request Information for FREE info on how to open a Precision Tune Auto Care franchise today! Please Note: This Precision Tune Auto Care franchise opportunity and other franchise business opportunities, businesses and franchises for sale on this web site are not to be considered as an "offering", "franchise offering", suggestion or recommendation by Franchise Leader™. This advertisement depends entirely on the truthfulness of the information provided by our advertisers which includes, but is not limited to, franchisers, franchise brokers, franchise consultants and business brokers. Franchise Leader™ recommends that you consult a lawyer, financial consultant, accountant or professional advisor before buying a franchise or business opportunity or any type of business. By using this form or any part of our website, you have agreed to all terms and conditions of Franchise Leader™. Please review our Terms & Conditions for more information.